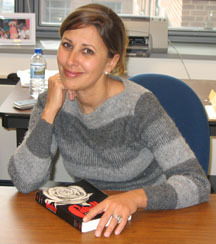 Maria E. Cotera is a jointly appointed Assistant Professor in American Culture and Women’s Studies at the University of Michigan, Ann Arbor. Her areas of interest include US third world feminist thought, American modernism, cultural anthropology and comparative race and gender analysis, among many others. During the last few years, Professor Cotera’s Intro to Latino/a Studies has participated on a filed trip to Southwest Detroit, which gives students an opportunity to experience Mexicantown through mural tours, visits to the local UAW office, area gallery, as well as dinning and retail venues. Throughout her active career at the University of Michigan, she has established and maintained meaningful, lasting relationships between the university and the broader community, in her efforts to bridge the divide between the university—as a community of academics, students and an institution—and the broader community in which they all reside. Professor Cotera has been instrumental in making this project come to life. Without her advice, support, and encouragement, the repatriados website project would not have been a success. To view a full transcript of the interview with Professor Cotera click here.